Anchor | Beer Apprentice - Craft Beer News, Reviews, Interviews and Info. Hello everyone. I appreciate you stopping by for a few minutes to check out another craft beer review. 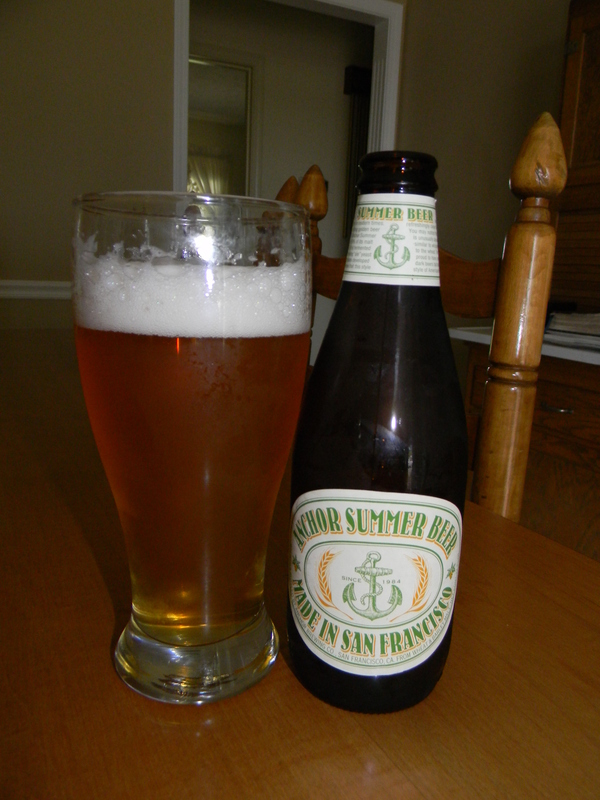 For today’s tasting I’m going to be trying the Anchor Summer Beer made by the Anchor Brewing Company situated in San Francisco, California. I’ve always had the greatest respect for Anchor products and I have yet to ever try this beer so I figured I’d give it a go while the weather was still warm to see what it was all about. I checked on their website, anchorbrewing.com, and discovered this enticing little description. The crisp, clean flavors of Anchor Summer ® Beer are refreshingly light, a thirst-quenching American-style filtered wheat beer. Released each year in advance of the summer season, Anchor Summer ® Beer is an all-malt beer, with over 50% of its malt derived from malted wheat. It is fermented with a traditional top-fermenting “ale” yeast, yielding a clean, balanced flavor that highlights the refreshingly light flavor of malted wheat. The head is unusually abundant due to the natural protein deposits of wheat, with a thick consistency similar to meringue. First brewed in the summer of 1984, Anchor Summer ® Beer is the first American wheat beer in modern times. Anchor Summer ® Beer is intended to be a lighter beer for those who don’t want to sacrifice tradition or character. It poured a relatively clear, golden color with a smaller, bright white head. The texture was a bit fizzy and soapy. The retention time was only average, however the lacing seemed ok to me. The nose presented some clean grain and wheat notes. Hints of crackers and/or fresh wafers accompanied some soft floral notes while a delicate lemon citrus scent added a bit more complexity. Not bad at all. The taste was quite bready and malty with a nice wheat presence. A decent little lemon citrus relish added some sweetness while a touch of grain and grassiness gave it that fresh savor. It was somewhat simple, but that’s ok with me for a Summer beer. The mouthfeel was medium bodied. Crisp, refreshing, thirst quenching and smooth. Not incredibly dry, yet not incredibly watery either. Right down the middle. A good medium strength carbonation allowed an ok amount of flavor to be left behind after each swallow. Overall, I found this to be a solid and suitable Summer brew. Easily one that I will have again before the season ends. The drinkability was outstanding and it has enough character to blow away any of those macro “lawnmower” beers that most drink. Anchor never disappoints. Their beers might not be among the upper echelon any longer, but they never produce sub par representations of any style. I’ll continue to support them as long as my craft beer journey keeps me thirsty for good beer. 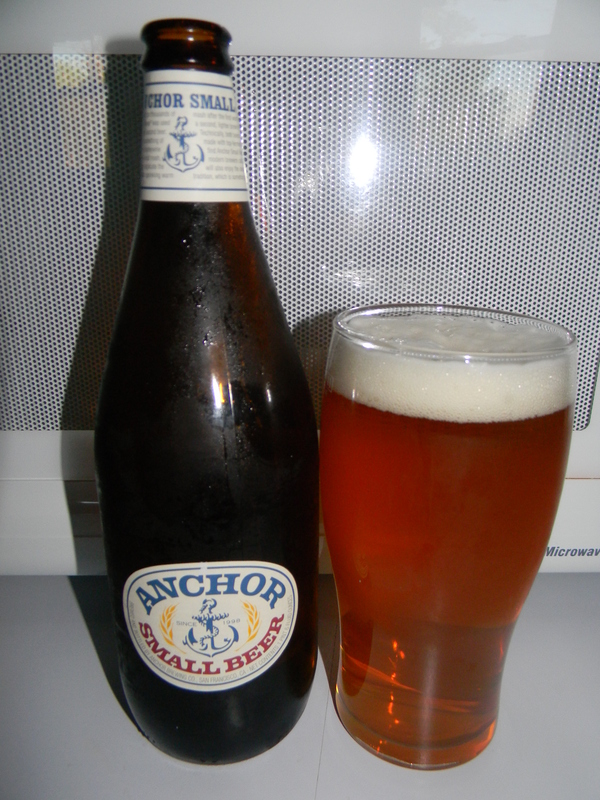 So, if you guys have yet to ever try the Anchor Summer Beer…. pick one up and give it a taste test. I think that you may enjoy it. Hello everyone. For today’s craft beer review I’m going to be trying the Anchor Brekle’s Brown produced by the Anchor Brewing Company located in San Fransisco, California. I tried this beer once last Fall and it’s been awhile since I last had a brew from these guys, so I thought I would try to give it a proper review for you guys this time around. From the website, anchorbrewing.com, we find this description of the Brekle’s Brown. 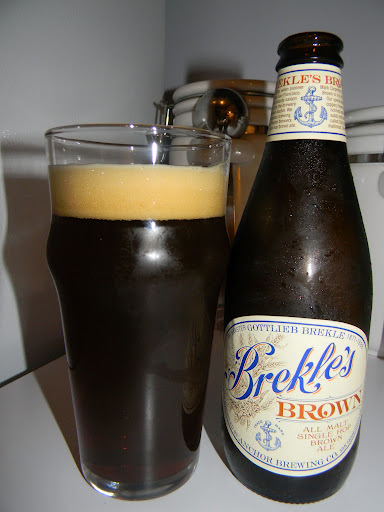 Inspired by the all-malt brown ales in Anchor’s brewing archives, Brekle’s™ Brown has a coppery brown color and unusual depth of flavor with hints of citrus which makes for richness and complexity without heaviness. The classic, all-malt, single-hop brown ale. Brewmaster Mark Carpenter’s unique recipe—a tip of the hat to our first brewmaster—looks to both the past and the future. It starts with a special blend of roasted malts. For brewing and dry hopping, a single and distinctive new American hop variety called Citra creates nuanced flavors and aromas complementing Brekle’s™ Brown’s unique maltiness. Anchor Brewing’s roots date back to the early 1850s and the California gold rush, when pioneer brewer Gottlieb Brekle arrived in San Francisco from Germany. In 1871, he purchased an old beer-and-billiards saloon near Russian Hill and transformed it into the little brewery that—twenty-five years later—would be renamed Anchor. Brekle’s™ Brown is a celebration of Anchor’s 140-year brewing legacy. This brew comes in a 12 oz. bottle and it has an ABV of 6.0%. It poured a mostly clear brown to deep ruby red color with some dark burnt orange highlights around the bottom of the nonic glass. The crown was light tan, smooth and slightly creamy in texture. It was sized fairly well and the retention time was ok, however the lacing was just average. The nose started with a nice wheat bread type of aroma interlaced with some subtle hints of chocolate and caramel malt. Very earthy and “leafy”. Some toasted grain as well as some slightly toasted hickory nut caressed the nostrils. I think that I also detected just a smidgen of coffee in there too. Everything seemed to be balanced very well and the overall fragrance was not over-the-top, but rather of medium strength. Not a bad bouquet at all. The taste released some burnt grain tinges right off the bat. More of that toasted nuttiness came through as well as some easily identifiable caramel/toffee sweetness. A negligible relish of chocolate malt discharged a minute amount of bitterness. Slightly toasted breads and earthy hops added some more complexity. I didn’t find any citrus as the description stated though. Oh well. The mouthfeel was medium bodied. Dry and smooth with just a tad bit of chalkiness. The carbonation was spot on and an “ok” amount of flavor was left behind on the palate after each sip. In general, I thought this was a pretty good Brown. It really commingled well with the cooler Fall weather we’ve been having around these parts lately. It’s definitely worth a try if you have yet to do so. It’s a super easy drink and solidly made. I, personally, don’t think that the Anchor Brekle’s Brown is a “world-class” beer, but it’s not necessarily one to be taken lightly either. It has plenty to offer in the way of aroma and taste. It could be contemplated and discussed or it could just be poured and enjoyed without much ado. Have you guys tried this brew yet? What did you think? Be sure to leave a comment and tell me your opinion. Thanks for checking back in on another craft beer review guys. I really appreciate it.